With Bittker on the Regulation of Interstate and Foreign Commerce, Second Edition, the authors supply a valuable analysis of constitutional commerce doctrine. 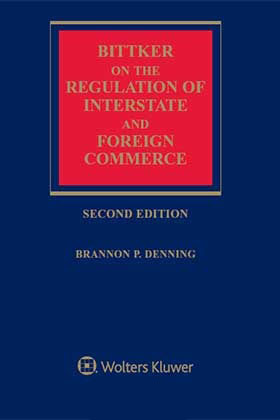 Boris Bittker, the universally recognized authority on federal taxation, turns his formidable talents with the assistance of Brannon P. Denning to an analysis of interstate and foreign commerce in this important work. With its Lopez ruling in 1995, the U.S. Supreme Court signaled a new era in interpretation of the Commerce Clause of the Constitution. Bittker and Denning respond to the many unanswered questions in the wake of the Lopez decision as well as the dramatic changes surrounding electronic commerce as they cover the full range of commerce topics, including the Federal Export Tax Bank, the Supremacy Clause, the Dormant Commerce Clause, economic protectionism by the states, commerce on the Internet, the Indian Commerce Clause, postal, military, and spending powers, the treaty power, the 21st Amendment, and much more. They also explore and explain the effect of the interpretation of the commerce power on various industries, including aviation, banking and financial services, insurance, and shipping. Their insightful analysis of court decisions illuminates the probable judicial approach to both existing and new legislation.